A fresh year is always a nice excuse to get a new smartphone — go-getters and adventure seekers need a smart, reliable digital sidekick to complete their bucket list for the year, after all. 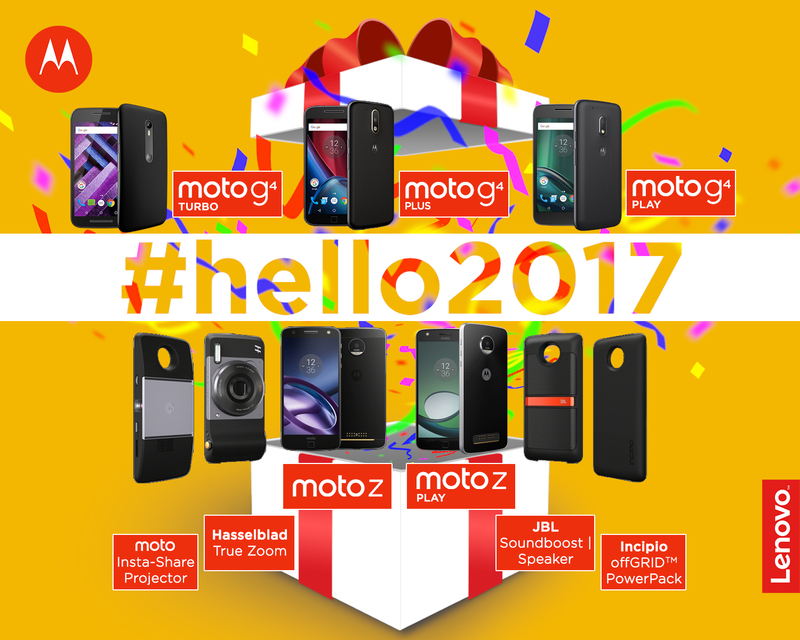 Welcome 2017 with a bang and try Moto’s newly launched smartphones, which packs in fun and functionality. With the enhanced productivity, speed, and mobility features, you can be sure to accomplish your #2017goals without a hitch. Beautifully crafted for fashion trendsetters, Moto Z epitomizes elegance and style: Moto Z is a head turner with its military, aircraft-grade aluminum and stainless steel build. As the world’s thinnest premium smartphone, Moto Z is only 5.2 mm thin. Don’t be fooled by its size though, as it packs a punch: powered by a Qualcomm Snapdragon TM 820 processor with 4G of RAM and 62G of internal storage, Moto Z delivers a smooth and blazing performance that keeps users ahead of the game. Moto Z sports a 5.5-inch Quad HD AMOLED display for optimal viewing experience. To top it all off, fashionistas can enjoy taking their OOTDs using Moto Z’s high-resolution 13MP rear camera with optical image stabilization and laser autofocus. Pricing for the Moto Z starts at P33,999. Meanwhile, Moto Z Play is the perfect companion for heavy multimedia users who need a smartphone that can last throughout the day. As the Moto smartphone with the longest battery life on a single charge, Moto Z Play can last up to 50 hours with regular use. Moto Z Play boasts of a 5.5-inch 1080p HD AMOLED display that delivers crisp and vivid images. It is powered by a Qualcomm Snapdragon TM 625 processor with 3GB of RAM and 32G of internal storage. Moto Z Play’s 16MP rear camera with laser and phase detect autofocus makes taking photos on any lighting condition such a breeze. Pricing for the Moto Z Play starts at P22,999. Moto Z Series smartphones are compatible with special snap-ons called Moto Mods: the Incipio OffGrid Power Pack, JBL Soundboost Speaker Mod, Moto Insta-Share Projector Mod, Hasselblad True Zoom Camera Mod, and Moto Style Shell Mods, which enhance the functionality of the smartphones. Without having to turn off the phone and remove the back panel, users can just simply snap the Moto Mods on using strong magnets that work like magic. The Moto G family of smartphones packs in all the essential features social media-savvy millenials need. Today’s selfie generation can capture the perfect picture with Moto G4 Plus’s 16MP camera with enhanced autofocus features, and upload them directly on social media without missing a moment. YOLO travelers keen on documenting their journeys will love Moto G Turbo, which is as adventurous as they are: Moto G4 Turbo features the IP67-rated dust and water protection, so users won’t have to worry about splashes and spills when they take travel selfies. Moto G Turbo also features a 5-inch full HD scratch-proof screen protected by Gorilla Glass 3. Notable for its long battery life, Moto G Turbo is powered by 2470mAh battery, which lasts the whole day without charging. Moto G Play, meanwhile, is a boon to mobile gaming enthusiasts: it packs in a Qualcomm Snapdragon 410 quad-core processor with 2GB and a 2800mAh battery that allows users to play all night. Pricing for the Moto G4 Plus starts at P13,999. Moto G Turbo and Moto G4 Play may be availed exclusively for free with Smart's GIGA Plan 999 and Globe's MyLifestylePlan 799, respectively. Welcome the New Year with a new Moto smartphone, and fearlessly take on 2017’s challenges without skipping a beat!